On August 2nd, the U.S. Government's Doomsday Machine is scheduled to be triggered automatically, bringing with it unspeakable economic calamity. The financial markets will freeze up, foreigners will stop financing our debt (except at exorbitant rates), the government will no longer be able to pay its bills, and American-style capitalism as we know it will go into freefall. Which is why, of course, President Obama has been exhorting Republicans and Democrats alike to come together soon over a debt ceiling increase that will prevent the U.S. Doomsday Machine from going off. But is really possible to prevent the Doomsday Machine from going off? 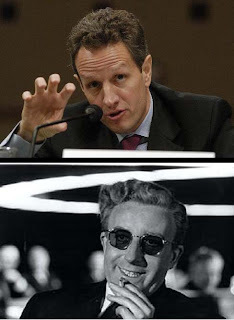 The very basis of building a Dr. Strangelove-like Doomsday Machine is that it must be designed to be triggered automatically AND that any attempts to un-trigger the Doomsday Machine will also automatically trigger it to go off. In this case, any attempt by the U.S. government to dismantle the underpinnings of the Doomsday Machine - such as by paring back government spending, reforming healthcare or increasing taxes - will itself also trigger the Doomsday Machine. Which is why we're at an impasse right now in Washington. If we cut spending, we risk an Athens Lite scenario on our streets. If we increase taxes, we risk shutting down the capitalist machine once and for all, as jobs dry up, economic investment plummets to all-time lows and stock values sink. The only problem with the U.S. building this perfect Doomsday Machine is that other nations can also rush to build their own Doomsday Machines, threatened as they are by a so-called Doomsday Gap. The technology is within their means, it only takes the will to do so. Consider China -- the once red-hot economy is showing signs of slowing and that is leading to serious concerns from global investors. There's talk of a potential credit crisis, a currency crisis and a general Chinese economic debt doomsday scenario. Not quite on the same scale, but Portugal and Ireland are also busy constructing their Doomsday Machines, eager not to be left behind in the global Doomsday Gap. For now, I'm with Kubrick. The only option may be to Stop Worrying and Love the Debt. Isn't that what we've been doing for the past 50 years? In the past half-century, Congress has acted 78 times to raise, extend or revise the debt limit. But is this time finally different?